Read the Commentary for Chapter 21. 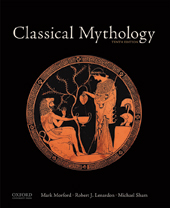 Investigate the images of Perseus from the Perseus Vase Catalog. View Cellini’s famous sculpture of Perseus carrying the head of Medusa. Read Apollodorus’ account of Perseus. Compare the selections of Hesiod that concern Perseus with Apollodorus’ account. In Pindar’s Pythian Ode 12, compare his treatment of the myth of Perseus with the authors you have read thus far. At this point it may be worthwhile to begin reading Joseph Campbell’s Hero with a Thousand Faces. What similarities do you see between the various heroes we have thus far studied? How closely do their lives seem to follow a pattern? How do each of them differ? Having investigated a number of artistic representations of the myth of Perseus, you may wish to consult Jocelyn Woodward’s Perseus: A Study in Greek Art and Legend to gain a more complete picture of the relationship between the myth of Perseus in literature and art. The Transformations of Medusa. Listen to and watch the fascinating and informative introduction by Jean Erdman (the widow of Joseph Campbell ) and then study her dance about Medusa. This video also includes the dance Hamadryad. What dimension does dance give to the interpretation of a myth? The movie Clash of the Titans has much to offer in excitement and quality. Study the scene in which Perseus kills Medusa and list all the imaginative details. Another opera of consequence by Richard Strauss to be explored is Die Liebe der Danaë. It combines the story of Midas with his golden touch and the wooing of Danaë by Jupiter as a shower of gold. We have already suggested listening to Les Danaïds by Antonio Salieri (Mozart’s rival), in connection with the Underworld. This opera is about Danaüs, Hypermnesta, and Lynceus, and the punishment of the Danaids. Know the English words derived from gorgon. Discuss the number of folktale motifs included in the saga of Perseus. Identify parallels to the folktale and fairy-tale themes of the saga of Perseus in other stories with which you are familiar. Tell the story of Io, and explain how Io and her descendants are associated with Egypt. What is the meaning and fascination of the archetypal concept of the Gorgon’s head? How would you characterize Danaë and Andromeda as heroines of saga?